It is usually hard for kids to adapt to a different schedule. For kids with challenges, it can be…well…even more challenging. • Meet the teacher and visit the classroom – If your child has an IFSP, IEP or 504 plan, be sure that the teacher is familiar with the plan and is prepared for your child’s arrival. Hopefully, you and your child have already met the new teacher and you feel comfortable with the transition plan. If not, now is the time to ask for an appointment with the teacher or the IEP team. Usually kids with special needs are allowed to visit their classrooms before the first day of school, to help them become familiar with the upcoming change. • Change bedtime hours slowly – As tempting as it is to let your little one remain outside to take advantage of every moment of daylight in the evening, start winding back his bedtime routine now. If you make changes in quarter hour chunks it will be less of a shock to your child’s system. For instance, if “bath, books and bed” usually began at 8:00 this summer, start the process at 7:45 for a night or two, and then move it to 7:30, etc. Use room darkening shades or curtains that block the light to help your child realize that it is nighttime. • Create a “special space” – Having a quiet, secluded spot where your little one can go to decompress can be very helpful. It can be in his room or somewhere in your home. It can even be under the dining room table! Often a beanbag chair or a blanket with 2 or 3 pillows, and a few books or special toys will help to calm your child. He can learn to go to his special space to unwind and quiet himself. • Turn off the computer – There is a time and place for everything. If your child needs help unwinding before bedtime, or when you need to leave the house to go to daycare or school, turn off all electronics. Use a timer if you need to help you with this task. When the timer goes off, then the computer goes off. • Meds adjustment – If your child needs medication to function at daycare or school (but he was not on the meds during the summer), be sure to talk with his doc about how to start up again. If possible start the meds a few days before school begins, to help with the adjustment and to re-check possible side effects. • A united front – You and your partner need to agree about your parenting plan. There is nothing more confusing to a little child than hearing “yes” from Mom but “no” from Dad. Try to anticipate issues and arrive at decisions ahead of time (and out of Junior’s hearing), and then stick with the plan. • Save the worrying – You may be consumed with worry before your little one embarks on a new year in a different class. 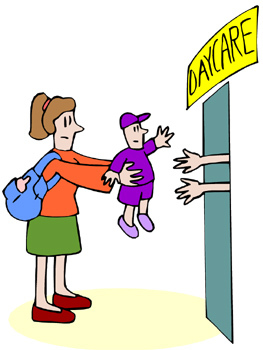 Even day care centers may have a different teachers and classrooms each year. Kids with special needs often have extra difficulty adapting to change…but sometimes they surprise you. Your little one may embrace the newness of the classroom or providers and all that worry was for nothing. So, don’t worry until you have to. Kids tend to pick up on a parent’s anxiety. The calmer you are – the calmer your child may be. • Cut yourself some slack – Let’s face it, even parents have trouble transitioning from summer to September! So, give yourselves a few weeks to fully adjust to the change. And, have plenty of patience (deep breathing anyone?) as you and your child struggle to say good bye to the lazy days of summer. What has worked for you when your little one faced big changes? Note: This post is part of the weekly series Delays and disabilities – how to get help for your child. It began in January 2013 and appears every Wednesday. Go to News Moms Need and click on “Help for your child” on the menu on the right side to view all of the blog posts to date. As always, we welcome your comments and suggestions for future topics.